Starting with a head or half a head of cabbage, thinly slice the cabbage until you have approximately 4 cups (not packed) of sliced cabbage. (Using a mandoline helps in this case.) Julienne a half of a carrot. Thinly slice a couple green onions. 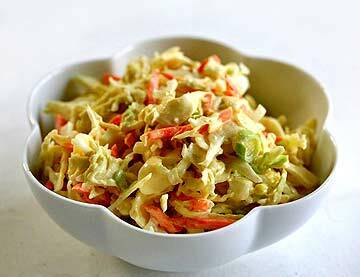 Add 3 Tbsp mayo, 1/2 teaspoon of yellow mustard and mix in with the cabbage, carrot, and onions. Add pepper to taste.